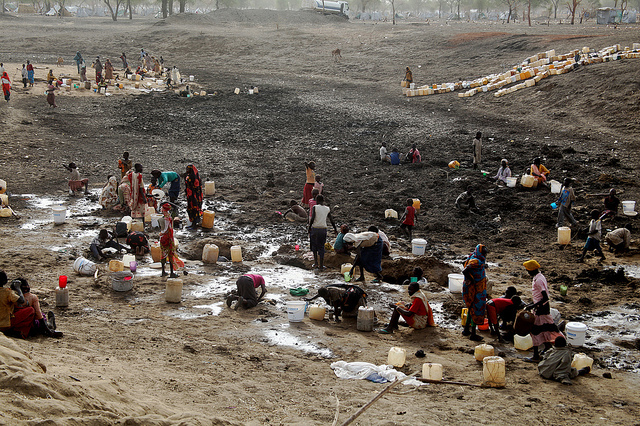 UNITED NATIONS, Feb 21 (IPS) - South Sudan Monday became the first country to declare famine since 2012, as UNICEF warned that 1.4 million children are at risk of dying from starvation with famine also imminent in Nigeria, Somalia, and Yemen. Protracted conflict is the root cause of the food crises in all four countries, reflecting the reality that famine is more often than not man-made. The South Sudanese government declared famine on Monday after its monitoring system found that some 100,000 people may die from starvation, while a further one million are on the brink of famine. "We can still save many lives. The severe malnutrition and looming famine are largely man-made," said UNICEF Executive Director Anthony Lake. "Our common humanity demands faster action. We must not repeat the tragedy of the 2011 famine in the Horn of Africa," said Lake. Others also described the disaster as man-made calling for an end to ongoing fighting to allow for food to be distributed. "WFP and the entire humanitarian community have been trying with all our might to avoid this catastrophe," said World Food Program (WFP) Country Director Joyce Luma. "But we have also warned that there is only so much that humanitarian assistance can achieve in the absence of meaningful peace and security." FAO Representative in South Sudan Serge Tissot described how South Sudan's people who are predominantly farmers "have exhausted every means they have to survive." "They've lost their livestock, even their farming tools. For months there has been a total reliance on whatever plants they can find and fish they can catch," said Tissot. Emma Jane Drew, Oxfam's Humanitarian Programme Manager in South Sudan also described the famine as "a man-made tragedy." "People have been pushed to the brink of surviving on what they can find to eat in swamps," said Drew. "We need an end to the fighting so that we can get food to those that urgently need it and provide them with support to rebuild their shattered lives." According to a joint statement from The Food and Agriculture Organization of the United Nations (FAO), the United Nations Children's Fund (UNICEF) and the World Food Programme (WFP): "A formal famine declaration means people have already started dying of hunger." The worst affected area is Unity State is in the northern-central part of the South Sudan, which was formed when it gained independence from Sudan in 2011. Doctors Without Borders/Médecins Sans Frontières (MSF) said that fighting in the area has made it impossible for them to open a hospital. "The extreme level of violence has had a severe impact on people's ability to meet basic needs such as safe drinking water, food supplies, shelter and health care," said Nicolas Peissel, MSF project coordinator. "People have lost everything and struggle every day to survive."